First off, welcome to the thread! The basics of posting will be explained in this thread, as well as some extra things. 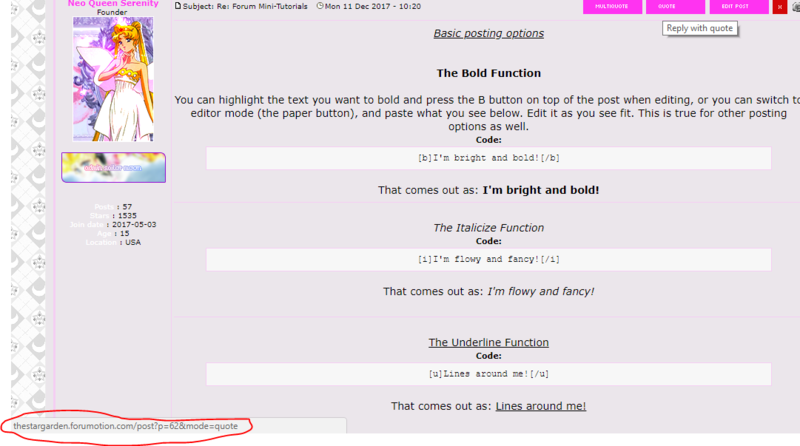 You can highlight the text you want to bold and press the B button on top of the post when editing, or you can switch to editor mode (the paper button), and paste what you see below. Edit it as you see fit. This is true for other posting options as well. That comes out as: I'm bright and bold! That comes out as: I'm flowy and fancy! That comes out as: Lines around me! This is the default text alignment. To create an unordered list, select the icon with bullets in a list. To create new list items, simply press spacebar. For example. Ordered list are nearly the same, the only difference is them being ordered. To make an order list select the icon with numbers in a list. in the post wherever you see fit. Great for fanfiction and long walls of text. Select the button with a white dialogue symbol to quote things. It is automatically used when you quote a forum post. For actual spoilers or lots of image, a spoiler will do. Select the icon that has the notebook with a caution sign and click & mouse over the text/content you want hidden. To create a table select the icon with a table button. You can select the border width, and numbers of columns and rows. Click insert afterward to add text/content to your table. To add an image, click on the picture button with a "+" next to it. Options such as "URL", "width" and "height" should show up. You have to put an image url in the first box (URL), and you may leave the other ones untouched (width and height). Select the H button and it will show you a dropdown with 3 options. "H2, H3, H4". Select one to get text in the format of a header. Select the "A" button with arrows pointing both up and down and you will get a dropdown with 5 options. "10, 13, 16, 18, 24", depending on your choice you will get larger or smaller text. Select the button that looks like a cube with a missing block. Select this and you will find a large collection of colors, choose one to your liking. Just make sure not to make it too light so we can see the text. Select the "A" button and it will display a dropdown with 11 font choices. Select one (there's are no rules for fonts, so use common sense) to style your text. You must mouse over take to use this fuction. Select the "A" button with a "-" sign. Use this to remove all styling (font, size, color) from text. Click on the dropdown and and choose a color! Or, if you prefer the default title color, leave it be. Upload your image to a hosting site. My favourites are imgur and Postimg. Copy the url of your uploaded image(s), and use as you like! However please read the graphics rules (Graphics Guide under the :important info" header in the sidebar box) for any limitations or guidelines. Visit an image rotator site, the most popular ones are SignAvatar and GrumpyBumpers. After the website gives you a link, add the link to your signature via the add image button. The reputation system is a completely optional thing here on the forum system. To give someone positive rep, click the little "+" sign on the right side of their post. To give someone negative rep, click the little "-" sign on the right side of their post.